Why Don’t the Democrats Nominate a Soldier? By Jonah Ullendorff / June 2, 2017, 1:56 a.m. The Democratic Party’s best option for the 2020 presidential election may actually be a veteran. Although there is a bevy of potential Democratic candidates for the 2020 presidential election, not one is a veteran. One of Donald Trump’s biggest weaknesses is his lack of military expertise, combined with his draft-dodging history and legacy of disparaging comments about military families. Democrats need to put forth a candidate with military experience in order to exploit Trump’s military weakness, which he was somehow able to turn into a strength in 2016. Trump is a chicken-hawk: he acts like he’s tough and militarily experienced, but has little military knowledge in reality and has not served in the armed forces. Trump managed to find a way to avoid the Vietnam draft, and he has even taken pride in his draft-dodging, comparing his experience avoiding STDs to Vietnam. He has claimed to be superior to military experts, boasting that he knows more about ISIS than the generals, yet is severely lacking in his knowledge of basic nuclear weapons policy. He has disrespected genuine war heroes, attacking Senator John McCain, whom he claimed was not a war hero because he was captured, and ridiculing a Gold Star family. He acts tough. He talks tough. But he has shown little respect for, or knowledge of, the military and has offered no real solutions. Democrats need a strong candidate, someone who can expose Trump as the chicken-hawk he is and reclaim the mantle of patriotism that the Republicans have undeservedly assumed. The Democrats need a soldier. A prominent one, one with irrefutable military experience that can easily overcome any false campaigns that question his or her service like the one John Kerry experienced in 2004. It is a problem for the Democrats that their brand is associated with a lack of patriotism. This problem is exacerbated by the fact that many of the most prominent current war veterans in Congress, like John McCain, Tom Cotton, and Joni Ernst, are Republican. Although Democrats have their own veterans in Congress, military veterans, statistically, tend to be Republican. In a political climate that favors outsiders, perhaps Democrats should move past current Democratic politicians who are veterans and embrace unconventionality by nominating a retired general. Despite not being politicians, generals do have plenty of experience in the highest ranks in government to give them credibility. They have experience running the world’s largest bureaucracy, the United States Armed Forces. If Democrats nominate a general in 2020, they can take crucial steps towards eliminating the monopoly on military, hawkish patriotism that Republicans have developed. When Democrats run military veterans, they get great results. For example, Jason Kander, a former Army captain, earned 46.2 percent of the vote in Missouri’s 2016 Senate race, despite the fact that Clinton received only 37.9 percent of presidential votes in the state. In his famous gun control ad, Kander was able to use his authority as a military officer to advocate for background checks without sounding like an elite who doesn’t know one end of a rifle from the other. Generals enjoy a popularity that typical politicians don’t, and they have a reputation for drawing support from both sides of the aisle. Presidents like George Washington, Andrew Jackson, Zachary Taylor, Ulysses S. Grant, and Dwight D. Eisenhower ran on their experience as successful generals. Eisenhower, the most recent general to hold the nation’s highest office, won the 1952 presidential election by 11 points, drawing a lot of Democratic support from the Democratic nominee, Adlai Stevenson. To win in 2020, Democrats need to retake swing states, and a popular, less partisan general can help them do just that. Generals have a poise and demeanor that stands above partisan politics, which draws people to vote for them in a way that no other potential candidate can imitate. Politicians who have served in the military constantly remind voters of their military status, because people like voting for military leaders. Military leaders appear trustworthy, competent, and, most importantly, able to keep Americans safe. Democrats must learn the lessons of past generals’ success. Though some may complain that a general may get a cold reception by Democrats given the party’s pacifist base, Democrats, just like their Republican counterparts, have a positive view of veterans. The most recent Democratic platform promised more funds for veterans and made it clear that the party opposed privatization of the Department of Veterans’ Affairs. Furthermore, Democrats have already voted for veterans in many congressional and senatorial races, and these veterans’ service was never viewed as a negative. Democrats might also fear that a general would be viewed as potential warmonger, but that image could quickly be overcome through successful communication with the base. In fact, most generals view our recent wars in the Middle East negatively—including Trump’s current secretary of defense, Marine General James Mattis. Had David Petraeus not pleaded guilty to mishandling classified information, he could have been a perfect candidate for the Democrats. Though he was once a Republican, and many Republicans thought he would one day run for office as a Republican, Petraeus has promoted many Democratic priorities in security policy. He has favored repealing “Don’t ask, don’t tell,” opposed torture, sought to end the war on drugs, and encouraged Franklin Roosevelt-style social welfare plans to rebuild Iraq. In the Petraeus mold are Admirals Bill McRaven, Samuel Locklear III, and James G. Stavridis. Like all military leaders, their political positions are hard to define, as it would be unprofessional for them to be partisan in their actions as flag officers. However, there are some indications that these men could make for successful Democratic candidates. McRaven was briefly rumored to be a potential VP pick for Clinton, indicating that he may be at least slightly to the left. A Navy Seal, McRaven is credited with the mission that killed Osama bin Laden—a major asset for anyone who wants to convert patriotic citizens from all sides of the aisle. His criticism of Trump’s attack on the media is also an indication of disagreements he may have with Trump that would encourage him to run against him in 2020. Locklear is a vocal advocate for combating global warming, a major plank in the Democratic platform. Trump, of course, has called climate change a hoax invented by the Chinese; perhaps the American people will realize how ridiculous Trump’s views are when he is contrasted with a distinguished admiral. Locklear has the experience to back up his claims: he has been the recipients of many medals and has commanded ships in Operations Enduring Freedom, Iraqi Freedom, and Odyssey Dawn. So when Locklear claims that global warming is the biggest threat to security in the Pacific, he has the experience to back it up. Stavridis is a known Democrat and was vetted to be Clinton’s VP before she eventually chose Tim Kaine. Stavridis was also a strong leader of NATO during his career—a further contrast to Trump, who can’t seem to decide if he likes NATO or not. The Democratic Party should start conversations and investigations into these men to see where they stand and if they would be viable candidates. 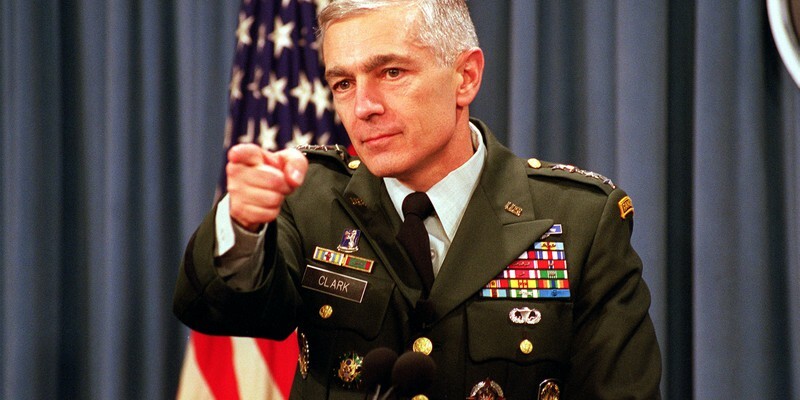 The Democrats’ best pick as of now is General Wesley Clark. Clark is a proven Democrat and even has some political experience in addition to his extensive military resumé. He ran for president in the 2004 Democratic primary, winning the Oklahoma primary before dropping out and endorsing John Kerry, the eventual Democratic nominee. Clark is a classic Democrat: he believes in global warming, supports women’s reproductive rights, gun control, and even single-payer health care. What is more is that he is a decorated four-star general, a perfect candidate for the Democratic Party. At seventy-two, Clark is on the old side, but he is still healthy enough to run a campaign and of comparable age to the seventy-year-old Trump. A Clark candidacy in 2020 could wreak havoc on the Trump campaign. How can Trump claim that his opponent is weak on terrorism and foreign policy, let alone “low-energy” or lacking “stamina” when he is an esteemed general? A general, and only a general, can take back the mantle of patriotism from Republicans and decisively define Donald Trump as the chicken-hawk he has always been.